The SVP Series has been discontinued. Please Flow Engineering Department for possible alternatives. The SVP Series of modular solenoid valves offers a variety of options for different applications. 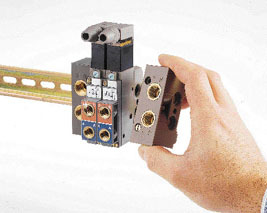 Valve assemblies can be cabinet-mounted using a standard DIN rail or can be surface mounted if required. The modular system is highly flexible both electrically and pneumatically, with many different port options. The P and R ports are integrated in the inlet and manifold end modules to feed the supply and collect the exhaust air. The spring clip mechanism ensures easy valve manifold assembly. The valves are space-saving, with each unit only 18 mm (0.7") wide. The system is very installation- and service-friendly. If a valve in the block needs to be changed, this can be done simply by loosening two screws. There is no need to dismantle the manifold assembly to add or change valves. (Power must be isolated before dismantling, however.) Additional features include lockable manual override, LED display, and suppressor. SVP-3 solenoid valves with NAMUR interface are ideally suited for piloting quarter-turn actuators on ball and butterfly valves, like the “Black Mushroom” valves used extensively in process control. The SVP-3 individual valves have a NAMUR flange interface. The flange mounts directly to the valve assembly. 참고: * SVPR and SVPL are required for each DIN-rail assembly. Comes complete with operator’s manual.